up and playing pretend. One day in school, she learns that they will be performing the play Peter Pan. In her excitement, Grace offers to try out for the part of Peter. The students' reaction is less than supportive. One classmate says that she cannot play Peter because she is a girl. Another tells Grace she cannot be Peter because she is black. This does not dampen Grace's enthusiasm, and she works hard to try out for the play. With the support of her mother and grandmother, Grace earn the part in the play and put her famous imagination to work. Her performance is loved by all. She know believes even more that she can do anything she sets her mind to, no matter what others say. 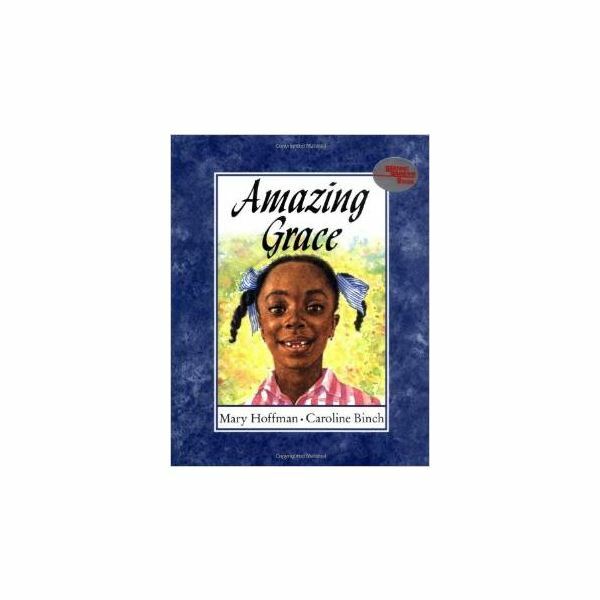 These Amazing Grace lesson plans will help you to inspire your students with this wonderful book. paper to brainstorm a list of words that could be used to describe Grace. Help the class with any synonyms they may not know. As you discuss these descriptive words, start a discussion about how difficult it would be to stand up to classmates, as Grace did. Encourage students to share situations when they may have felt pressure from classmates, and how did they handle it. What would they have done if they were in Grace's situation? What strategies can students use if they find themselves in a similar situation? Students can use the words they brainstormed to draw a picture of Grace. Have each student draw an outline of Grace and use the words they brainstormed to fill in the picture. They can use words to fill in strands of hair, outline her mouth, or as details on her clothes. They are using the words to help paint and complete the image of Grace. Additional details can then be added or colored in with crayons or colored pencils. Use the descriptive word list for a lesson on analogies. Choose some of the descriptive words on your class list and guide the students through writing analogies to describe Grace. Example: Grace is like a star in the sky. We love to sit and watch her sparkle. The class can also write similes and metaphors using the list of words. They can then choose a simile or metaphor and draw a photo to accompany the phrase. Example: Grace was as brave as a warrior. Grace ends up playing the lead role in Peter Pan. Ask students to pretend they are a critic. Give each a copy of this template for writing a news article. They should write an article about Grace's background and how they think the performance went. There is also a spot for them to add a photo of Grace. With rampant bullying and the bad messages surrounding children today, positive stories can always provide a ray of sunshine to your lesson plans. Amazing Grace offers a refreshing look at what children can accomplish when they put their mind to something. It is a story about bravery, racism, and the struggle to be who you want to be. It is a book every teacher should share and discuss with their students.